A growing community of people – from different backgrounds, stages of life and experiences, including the vulnerable – who are one family in Christ Jesus. A people who believe that God speaks today through the Bible and his Church. A people who worship God, seeing their whole life as worship – serving God. A people who desire to grow in their relationship with God and in serving Him. A people who want to play their part in the wider Church in Luton, in this nation and in the nations. A people who value humility, servanthood, generosity and authenticity. Partnering with various agencies & organisations whether faith based or not in the community. Working within the different nations living in Luton. 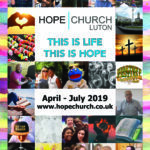 Using the Hope Church Centre as a community centre to serve people in Luton. Building new communities or churches of God’s people both in this nation and overseas that have an impact on society. Providing a range of community services that meet the full range of local people’s practical needs – from money advice to learning English. Bringing the power of God – His Kingdom – into people’s everyday lives, from seeing the sick healed, to God inspired words that bring hope, both in and out of meetings and in and out of our building.